Robert Corona Jr., DO, who founded Upstate Medical University’s Telemedicine Program in 1995, and held a leadership position at Welch Allyn Inc., returns to Upstate May 1 to head the Department of Pathology as the John B. Henry Professor of Pathology and Laboratory Medicine. The announcement was made by David Duggan, MD, interim dean for the College of Medicine. Dr. Corona is an experienced neuropathologist and leader in bioinformatics and the application of technology at the cutting edge of medicine. He is the author of numerous published manuscripts and patent applications and new device evaluations required by the FDA for new product development. Dr. Corona most recently served as the chief medical officer and vice president of Medical and Scientific Affairs at Welch Allyn Inc. in Skaneateles. 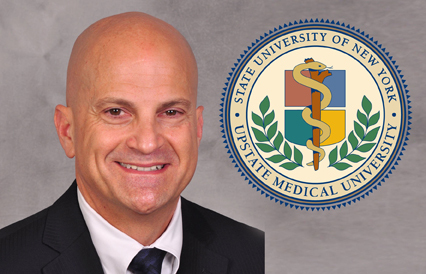 While at Welch Allyn he also served in several capacities at Upstate, including clinical professor of pathology and laboratory medicine, with secondary appointments as clinical professor of emergency medicine, medicine, and family medicine. He has maintained a hospital appointment at Upstate University Hospital as an attending neuropathologist for more than 20 years. He has lectured widely on issues related to the interface of technology and advances in medicine. He founded Upstate’s Telemedicine and Medical Informatics Program in 1995, which at that time was named one of two national Healthcare Open Systems Trial sites and was nominated for the Computerworld/Smithsonian Award for Excellence in Medicine. As a professor at Upstate he received Best Teacher of the Year in the Pathology course and the President’s Award for Excellence in Teaching. Dr. Corona received his doctor of osteopathy degree from New York College of Osteopathic Medicine. He subsequently performed clinical training including a rotating internship at Southeastern Medical Center in Miami, followed by training in neurology, anatomic pathology and neuropathology at Upstate Medical University, with special fellowships in neuropathology at the Armed Forces Institute of Pathology and with Dr. George Collins at Upstate Medical University. He is board certified in anatomic pathology, neuropathology, and medical management and has been certified as a physician executive by the American College of Physician Executives. A member of many state and national organizations, he has served as a member of the Board of Directors of the American Osteopathic Foundation, a member of the Federation of State Medical Boards Working Group on Telemedicine, and as an appointed member of the Office of Professional Medical Conduct, New York State Department of Health. He is an emeritus member of the New York State Board for Medicine.